Long live the Cham Congress, 1945. This British military document reports on the First Cham Congress held in Vlora (Valona) on 23 September 1945 in which the Cham Albanians from Greece, expelled from their land and now refugees in southern Albania, took stock of their situation. The Congress Hall was decorated with the flags of the Allies and numerous propaganda posters, for example, “Long Live EAM”, “Death to the Greek Monarcho-Fascists”, “Long Live the Communist Party” etc. The chairman, Kasim DEMI, spoke on the misery of the Çam refugees in Albania caused by the atrocities of Zervas and EDES reactionaries. Honorary Presidents were elected, being the Big Three, Enver HOXHA, TITO and ZAHARIADHI. First speaker was Liri GEGA who represented the Anti-Fascist Council of Albania, and was followed by representatives of the Army, Youth and Women’s organizations. Later the representative of the Albanian Red Cross, Abas SHEHU, made a political speech in which he condemned the present Greek government, Zervas, etc. Other speakers required the speedy return of the Çams to their homes under protection of the Allies. Dr. Idris ALLUMI, a Çam emigrant, declared that there was no point in sending commissions into Greece to investigate the atrocities committed by the Greek reactionaries as there was no liberty of speech in that country. Such a commission should, he stated, be sent to Albania to meet the emigrants, who were free to speak as they wished. He suggested a white paper be published for the benefit of the Allied Missions giving facts, documents etc. relating to the Greek atrocities. Vehip DEMI, President of the Çam Council, then gave a political report demanding the return by the Allies of the war Criminal Nuri DINO who, he stated, is now free in Italy. The Çams, he said, agree that the Allies should recognize the Albanian Democratic Government. The Çams were prepared to fight alongside the Albanian forces in order to destroy the remnants of Fascism. He finished by thanking the Albanian Government for their agreement with UNRRA on behalf of the Çam refugees. 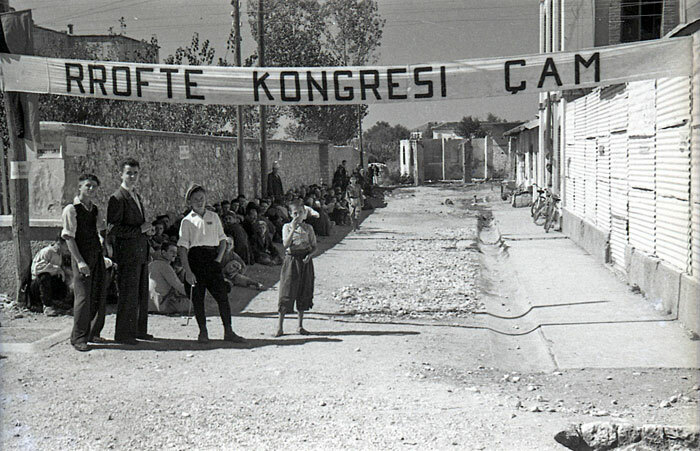 In the evening demonstrations were organized by the Çams calling for recognition of the Albanian Government and the return of Traitors and War Criminals.